The genus Sedum includes a broad-range of succulent-leaved plants. Some are very upright and suited to the average perennial garden. Others are mounding or spreading and thrive in poor, droughty planting sites. All have dainty star-like blooms that grow in clusters of various density and size. 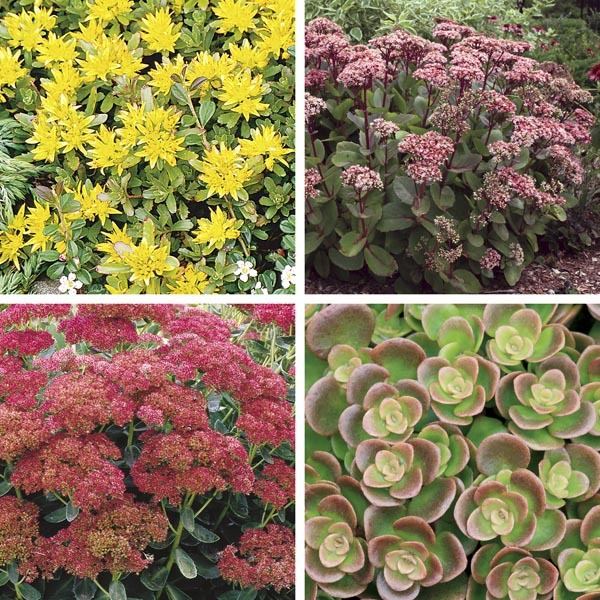 Classic plants for rock gardens! Makes a dependable mixed border plant. Combines beautifully with small ornamental grasses. Terrific plant for butterfly gardens. Tolerates poor soil, heat, and drought. Does best in light, well-drained soil. Allow soil to dry between thorough waterings. Protect from excessive winter moisture.